The mojito is one of Cuba’s oldest cocktails and comes from the African word mojo, which means to place a little spell. There are several accounts as to the origination of this drink. 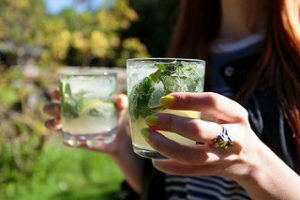 Other accounts suggest that slaves working in Cuban sugar cane fields in the late 19th century invented the mojito. Ernest Hemingway fancied them at La Bodeguita del Medio in Havana as well as in Key West (his favourite drink was the daiquiri, though). James Bond (aka Pierce Brosnan) drank one in Die Another Day, which was set in Cuba. The muddled cocktail has also made an appearance in the most recent Miami Vice movie! Ernest Hemingway requested Mojitos without sugar. Of course, this suggests that less lime juice be used so as to keep the drink from being too tart. Maybe Ernest liked an extra sour rum cocktail. For a twist on the traditional mojito, add a handful of raspberries during the muddling stage for an extra hint of flavour. Added sweetness can come from using a lemon-lime soda, like 7up or Sprite instead of plain soda. Instead of using lime juice, look at adding a couple lime wedges to the mint and muddle the two together. The flavours from the rind of the lime add nicely to the drink. Simple syrup can also be added instead of the sugar, which then ensures all that sweetness is completely dissolved prior to serving.